A majestic voice has joined God’s heavenly choir. 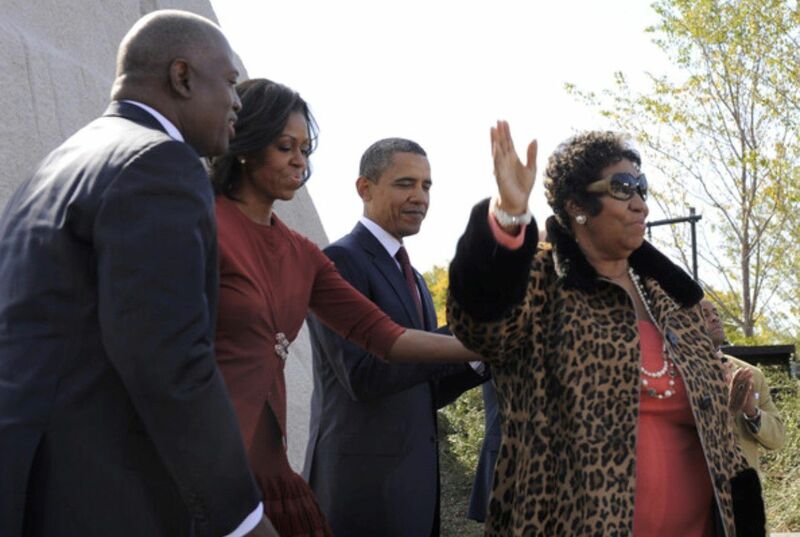 We are saddened to hear of the passing of Ms. Aretha Franklin, an ardent supporter of The Martin Luther King Memorial in Washington, DC. Whether singing at our Dream Concert or at our official dedication event...Aretha was always stellar and will forever be the Queen. Our continued thoughts & prayers are with her family & friends. We at The Memorial Foundation will miss her & shall always remember her life! one-year anniversary of the opening of the Martin Luther King, Jr. Memorial. The Memorial Foundation exists to promote awareness of the Martin Luther King, Jr. Memorial located in Washington, DC and its tenets of democracy, justice, hope, and love as well as to support the general upkeep of the Memorial in future years. Additional information regarding The Memorial Foundation, Inc. can be found at www.TheMemorialFoundation.org. At sunset on April 4, the Washington, DC Martin Luther King, Jr. National Memorial Project Foundation, Inc. invites the public to join them as they honor the life of Dr. King on the anniversary of his assassination by holding a candlelight vigil and laying a wreath at the foot of the Stone of Hope at the Martin Luther King, Jr. Memorial. BAE Check PresentationWashington, D.C. (November 8, 2011) – Today, the Washington DC Martin Luther King, Jr. National Memorial Project Foundation, Inc. acknowledged BAE Systems for its $1 million donation during a formal check presentation ceremony held at the recently dedicated Martin Luther King, Jr. Memorial on the National Mall in Washington, D.C.
On August 28, the Martin Luther King, Jr. Memorial will celebrate its one year anniversary being open to the public. To mark this occasion, the Washington, DC Martin Luther King, Jr. National Memorial Project Foundation, Inc. invites the public to join them as they celebrate this anniversary. This historic memorial was officially opened in August 2011 and was formally dedicated by President Obama on October 16, 2011. WASHINGTON, DC – The Memorial Foundation, Inc., the foundation responsible for building the Martin Luther King, Jr. Memorial on the National Mall, Northrop Grumman and the Motion Picture Association of America (MPAA) have united to present an inspiring and powerful summer film series at the Martin Luther King, Jr. Memorial. This summer will mark the Memorial’s fourth anniversary, and both organizations look forward to celebrating through this free and public series which will include the movies Black or White, Annie, and Selma.